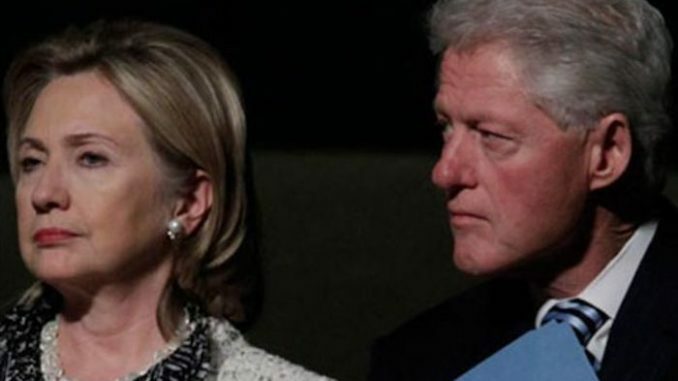 Three Clinton Foundation whistleblowers are set to testify about Bill and Hillary Clinton’s various nefarious crimes on Thursday. Following allegations of shady accounting, tax fraud and pay-to-play, the Clinton Foundation will be under a Congressional microscope this week after three whistleblowers agreed to testify. One of the whistleblowers secretly submitted 6,000 pages of documents to the IRS and FBI in August of 2017, and all three have submitted various documents to Congressional investigators. Zerohedge.com reports: Rep. Mark Meadows (R-NC), Chairman of the House Freedom Caucus, told Fox News’s Martha MacCallum on Monday night that there are three whistleblowers who have spent the past two years investigating the Clinton Foundation, and have “explosive” allegations which they will share during Thursday testimony on Capitol Hill. MACCALLUM: OK. With regard to the investigation, which doesn’t get a lot of attention, into the Clinton foundation, the DOJ designated John Huber to look into this. They have 6,000 pages of evidence that they’ve gone through. The foundation raised $2.5 billion, and they’re looking into potential improprieties. What’s next on this investigation? MEADOWS: Well, I think for the American people, they want to bring some closure, not just a few sound bites, here or there, so we’re going to be having a hearing this week, not only covering over some of those 6,000 pages that you’re talking about, but hearing directly from three whistleblowers that have actually spent the majority of the last two years investigating this. Some of the allegations they make are quite explosive, Martha. And as – we just look at the contributions. Now everybody’s focused on the contributions for the Clinton Foundation and what has happened just in the last year. But if you look at it, it had a very strong rise, the minute she was selected as secretary of state. It dipped down when she was no longer there. And then rose again, when she decided to run for president. So there’s all kinds of allegations of pay-to-play and that kind of thing. As we noted in late November, the Clinton Foundation has seen donations plummet approximately 90% over a three-year period between 2014 and 2017. While Hillary Clinton was Obama’s Secretary of State, however, the State Department authorized $151 billion in Pentagon-brokered deals to 16 countries that donated to the Clinton Foundation – a 145% increase in completed sales to those nations over the same time frame during the Bush administration, according to IBTimes. That submission made with the IRS, and eventually provided to the Justice Department in Washington and to the FBI in Little Rock, Arkansas, alleges there is “probable cause” to believe the Clinton Foundation broke federal tax law and possibly owes millions of dollars in tax penalties. That submission and its supporting evidence will be one focus of a GOP-led congressional hearing Thursday in the House. In some instances the Clinton Foundation appears to have misled the IRS, or lied when filling out forms. For example, the Foundation retracted a bid to conduct fundraising in Utah after they refused to correct a filing error which state officials would not allow.